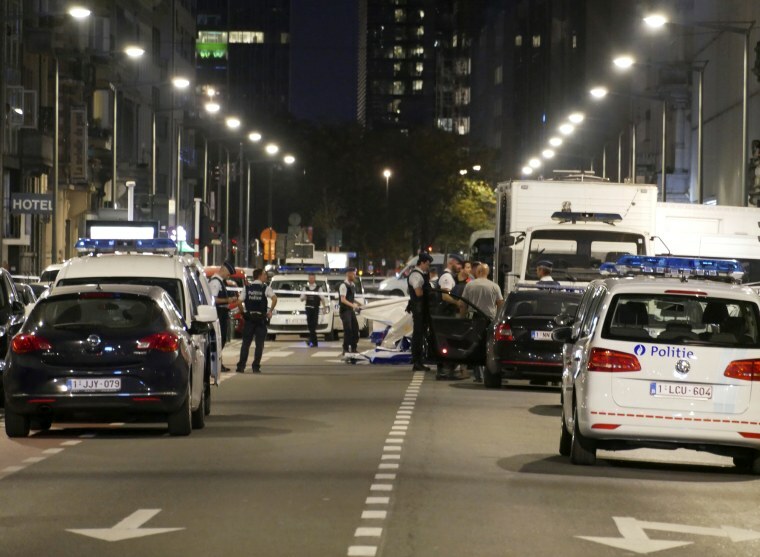 BRUSSELS — Belgian soldiers shot a man dead in downtown Brussels on Friday evening after he attacked the troops with a knife in what prosecutors described as a "terror attack." Spokeswoman Esther Natus of the federal prosecutor's office, which handles terrorism investigations, said the man twice shouted "Allahu akbar," Arabic for "God is great," as he ran at the soldiers. "We do consider it a terror attack," Natus said. She declined to identify the man or confirm whether he was known to police, saying only that "the suspect is dead" and one of the soldiers was slightly wounded. Brussels Mayor Philippe Close said three soldiers came under attack and one had been hospitalized. Federal Police spokesman Jonathan Pfunde also confirmed some details of the incident and said the attacker had been "neutralized." Belgium's anti-terror crisis center tweeted that the situation was "under control." "All our support is with our soldiers," Prime Minister Charles Michel said via Twitter. "Our security services remain on alert. We are following the situation closely." Associated Press television images showed that police sealed off a main street near the Grand Place, a central square that is a popular tourist site. A man who lives near where the incident took place on Boulevard Emile Jacquemain said he saw the attacker lying in the street in the aftermath. "I live right in front of the station. It was already blocked by police at the scene and there was a man lying on the ground. The police said he had been shot by soldiers," said Thomas da Silva Rosa, a public affairs consultant. "He was lying on the ground, appeared dead," he told AP. Belgium has been on high alert since suicide bombers killed 32 people in attacks March 22, 2016, on Brussels' main airport and subway system. Soldiers and extra police have been deployed at public buildings and around large gatherings for more than a year.